On September 17, 2018, at 1:44pm, the Sacramento County Sheriff’s Communications Center received a 911 call regarding a disturbance at a local business located at the 10000 block of Folsom Boulevard in Rancho Cordova. Two officers with the Rancho Cordova Police Department, a contract city with the Sacramento County Sheriff’s Department, responded to the scene. The initial call for service gave no indication that the suspect was armed or dangerous. Upon arriving on scene, Deputies Julie Robertson and Mark Stasyuk were fired upon by the suspect and able to return fire. The suspect fled from the initial scene on foot and was again engaged by other responding deputies at a secondary scene. The suspect was taken into custody and transported to a local hospital, where he was listed in stable condition. During the initial encounter, Deputies Robertson and Stasyuk were shot by the suspect. Deputy Robertson, a three and a half year veteran, was shot in the arm and is in stable condition. Tragically, Deputy Stasyuk’s injuries were not survivable and he passed away shortly after arriving at UC Davis Medical Center. 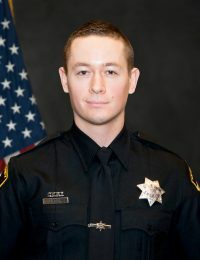 Deputy Mark Stasyuk, age 27, was a four and a half year veteran of the Sacramento County Sheriff’s Department and was assigned to the Rancho Cordova Police Department as a patrol officer. Deputy Stasyuk is survived by his wife, mother, father, and sister. He was preceded in death by his older brother.